I’m reporting a few players. I wouldn’t normally. I really wouldn’t. But I do believe this group is in need of some administrative action. If nothing else, this post can be a warning to other players not to ally with them and maybe even to stay out of games with them. I realize that making this post is not in the spirit of the game, and possibly against the rules, but I feel it is necessary. These players are very actively ruining the experience of the game for veterans and new players alike, and the community is too small to have people walk out after preventable bad experiences. The main culprit, and name that keeps popping up is Eurochamp. Other names that associate with the group: NikSweden, Kong Empire, Tom Pernis, Trumpet, and 'The [country here] Banker". The offenses: They sign up together and rig games. The banker is a feeder account always donates it’s stars to Eurochamp and attacks whoever is on the other side. Sometimes they ally other players but consistently f*ck them over, using the feeder account if needed. The rest is details, but in general they simply don’t engage with others. Messages are ignored until they are losing, at which point they try to feign switching sides but consistently stick together. I encountered them twice myself, and was super annoyed. Talking to some other players who are regulars it turns out they have the same experience and same sour taste, so I decided to write this post. I ask anyone with first hand experience to add to the story here, so we can properly communicate the scale of the problem. Now, I do love myself a good bit of backstabbery, I realize that that is an inherent (and important) part of the game. There’s plenty of players on my permanent no-go list (and I suspect i’m on a few of theirs also), but this goes beyond that. I really feel that they are not playing the game, but breaking it. Jay, please take some action or monitor the situation. Thanks! I can confirm this 100%. They have even confirmed the use of dummy accounts in in-game comms. I too have encountered this. Well I was allied to Eurochamp (against my better judgement) and Niksweeden this morning. I called them on some questionable practice with Espresso. All three players quit in a 15 min period. Very odd. I will seek and destroy Eurochamp in any game I see. If anyone see’s him, please let me know. I have suspended EuroChamps account. Hopefully he can get in touch and let me know what has been going on. Maybe you are describing some kind of “Griefing” ? Thanks for the heads up, Brand, HBT, NickM … us ‘veterans’ generally can survive the experience of having a ‘game’ destroyed by fools like this, but the supply of noobs (who will become the new veterans and help to provide the future life of an excellent game) gets choked off. They will associate the game with cheating and that is unacceptable. In a 32 player game that is going on right now there is a 6 feeder account team thing. Some more veteran players suspect eurochamp is back with new accounts. @nick.muzzio and @Brand are in said game. Well at the end of the game we can look at the True Alias of these guys. One of the did confirm to me that he was Eurochamp. He actually told me that joining as a team and allying and then fighting together isn’t fair lol. It really is sick what happened in “overpopulation”. It was so obvious it wasn’t even funny. What I meant in my last post is that he told me that what I do by joining with other players, allying them wasn’t fair to noobs. He knows I do this, we all do it. Allying is even encouraged in the criteria for giving renown and there are badges for it. It’s a strategy every player can use. I don’t understand how that could be “unfair”. On a related note almost every player who playing normally tried to ally with each other and defeat them. The efforts failed but it was a memorable np experience. Maybe we should create a new overpopulation game with a password. They could just be a very good team. We probably shouldn’t throw around accusations. In overpopulation I was immediately attacked by sharkey and pimpus. They gave their stars to pine tree and parfurzia. Pine tree won. 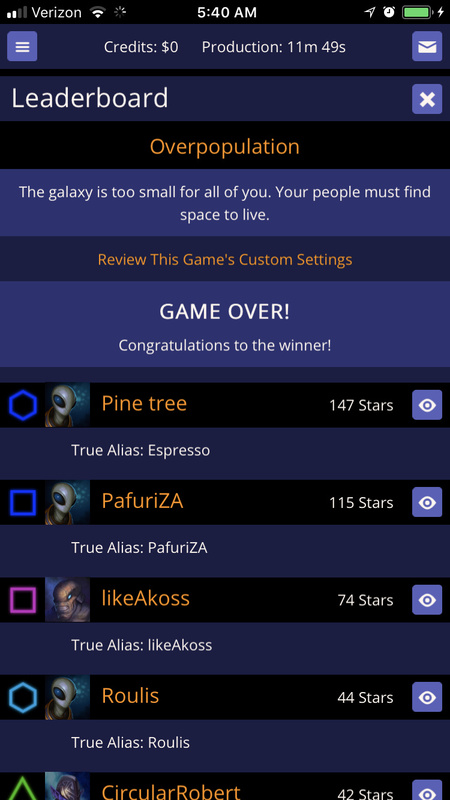 Pine tree’s true alias is Esspresso. Esspresso was the reason this thread of posts started because in an earlier game he gave all of his stars to Eurochamp in a game and attacked me in doing so. In this game Sharkey’s true alias is Niksweeden, also mentioned in earlier posts in this thread. All I can tell you is that time and time again Eurochamp and Niksweeden start out with players next to them that don’t build infrastructure, attack other players, and give them their stars. 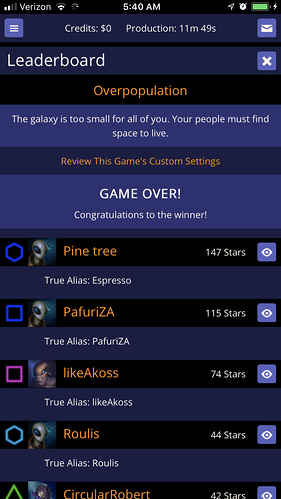 Many accounts in this game gave stars to both pine tree and pafurzia as I watched. I wonder why they let the players with less victories, rank, renown and badges win. I may be wrong, but I believe I was one of the first players to encounter these fools. And, I actually stopped, and continue to refrain, from hosting or playing public user-created games. It’s been about two years now of me only engaging in 64 player madness. In fact, it was BECAUSE of this crew of “players” that I actually got into 64s at all! Because the chances of them canoodling are so low with the vast array of population. For that alone I thank them. I probably would have taken an extra two weeks to get into the real A game with the other vets. These idiots literally play the game to troll. They admitted, a few years back, that they were in middle school. They exist to troll players, veterans and noobs alike, just to laugh at everyone and insult other alliances. That is their reason for playing. During my experiences, they were in almost every game, and always worked to ensure they were in a better position, and then quit the moment politics got interesting. I think one of them may have legitimately wanted to play, but he’s one of the pack of idiots and so goes along anyway. I could care less. As long as they remain active presence out there, I refuse to engage in ANY games that don’t already have a high veteran count or premium player only restrictions, which these days means taking forever. Lots of the veterans I remember from the good old days are gone, such as Dreams and a crew of amazing players who seem to be from the old NP1 but vanished around the end of '13. My good ally Ultraviolet, too, has vanished, along with a few who’s names I sorrowfully can’t recall. Only Brand remains among the ancient veterans of those bygone years. Being a relatively “new” veteran, I can only imagine how many true aliases have come and gone. So yes, I agree. Action must be taken, Council of Ancient Ones. These perverted pranksters must have their foul presence expunged from our dear game. It is already on life support. No need to let viruses pollute it. I’ve not encountered these players, but it sounds like bad form. @Smulm I think you’ve underestimated the number of veterans out there (e.g. I was around in NP1 and I can think of a few others), so why not just create premium only games and announce them in this forum. For me, if you enjoy the game… stump up the cash!